The 2010 Marsden fund results were announced by the Royal Society last week. The Marsden fund supports much of New Zealand’s blue skies research and is one of the most prestigious grants available to New Zealand scientists. 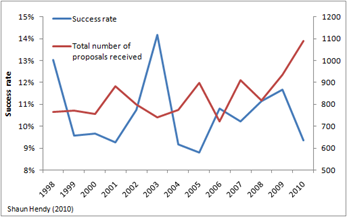 In total this year, 102 proposals were awarded just under $60m to be spent over the next three years. How does this year compare with previous rounds? Well, this year’s success rate of 9.4% is lower than usual, closer to the low of 8.8% achieved in 2005 than the long run average of 10.5%. This seems to be mostly due to the large increase in proposals received, up from 934 last year to 1089 this year, rather than a drop in the number that were funded. materials science; engineering (including bioengineering and other cross-disciplinary research activities); operations research; nanotechnology; engineering aspects of computer science, software and hardware engineering; applications and robotics; and engineering aspects of information science. With this new panel, the Marsden fund has probably tapped into a more applied sector of the research community that previously had some difficulty in fitting into the old panel structure. However, the total funding allocated declined this year, from more than $65m last year to just under $59m (in CPI-adjusted 2009 dollars). This reverses a steady increase in total funding that began in the middle of the last decade. Funding per proposal also declined slightly this year, with proposals this year receiving $575k in 2009 dollars on average, or approximately $190k per year for three years. 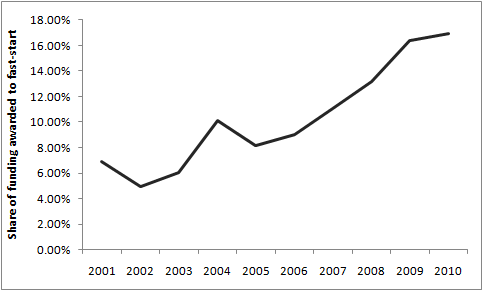 As I discussed in a post last year, grant sizes have grown substantially over the last decade. 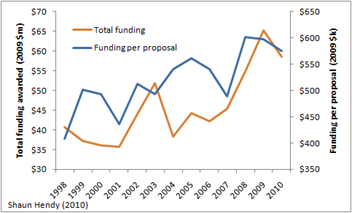 This small reduction in funding per proposal does not reverse the long term trend upwards. Finally, the share of funding awarded to fast-start proposals continues to grow, with nearly 17% of the pool awarded to early career researchers. This fast-start category is open to those who obtained their PhDs within the previous 7 years. A fast-start grant can be a particularly important step in a young scientist’s career, although the funding received (capped at $100k p.a. for 3 years) is really only sufficient to support some salary buy-out for research time (typically 25%) and a graduate student. Nonetheless, the prestige associated with a fast-start award is high and I can think of several examples amongst my colleagues where such an award has led to the offer of a permanent position. However, there is now a substantial overlap between the fast-start category and the new Rutherford Discovery Fellowships, open to early career researchers 3 to 10 years from their PhD. The latter runs for 5 years rather than 3, providing a much more substantial salary buy-out and the opportunity to support several graduate students. With the creation of this new scheme and the disappearance of the NZ S&T post-doctoral fellowships, I think there is now an argument to be made for capping the growth in fast-start funding. To fill the gap that must surely now exist for our best and brightest immediately post-PhD, the community will need to fund more post-doctoral fellowships out of full proposals. (Disclosure: I am a Principal Investigator on one current Marsden funded project awarded in 2008. This year I also served on the Physics, Chemistry and Biochemistry Marsden panel and Physical Sciences, Engineering and Mathematics panel for the Rutherford Discovery Fellowships). Shaun – you are well placed to give some inside information on how the panels make decisions. Frankly I find the entire process from an applicant viewpoint to be ridiculously opaque. We spend a huge effort trying to write a 1- or 2-page (depending on panel) application at the first round, and get essentially zero feedback. How hard would it be to say: the panellists score each proposal numerically, the scores are aggregated in the following manner, the cutoff score for 2nd round was x, your score was y? At least we could get an idea whether it is a waste of time applying in future. Also, the discouragingly low success rate and the killing of NZST postdocs seem to be going in the wrong direction compared to many other countries who have much more generous funding schemes. Given the obviously arbitrary nature of some of the funding decisions (which is probably why detailed reporting such as I mention above doesn’t occur), it seems crazy to give large grants to few people. Have you heard any discussion of adopting a system more like Canada, where far more people get small grants? For those in expensive fields, a few tens of thousands per year may not be worth thinking about, but for me and many others, it’s the difference between being internationally credible and not. you are right that the lack of feedback at the first round is frustrating, although I think that these days you are told if the panel have ranked your proposal in the top half. 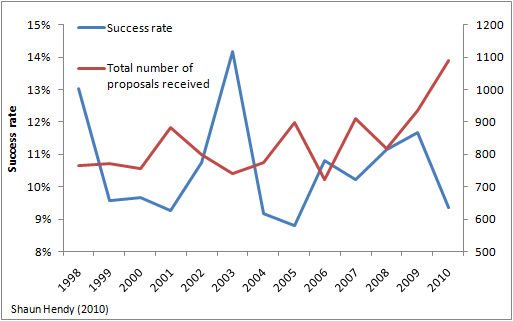 However, now that the proposal process is on-line, I think it ought to be possible to do slightly better. For instance, I suspect it would not be too difficult to release your proposal’s ranking through the on-line portal – I will suggest this to the Royal Society. Unfortunately, at the first round it would be difficult to provide more feedback due to the extra load this would put on the panelists. Reading sixty proposals in six weeks during evenings and weekends is difficult enough without also having to provide suggestions as to how proposals could be improved. After the second round, you can seek direct feedback from the panel chair. My advice is to make sure you get robust feedback from colleagues before you submit your proposal. Remember that panels are diverse (e.g. the MIS panel will have pure and applied mathematicians, computer scientists and statisticians), so try to seek comment from people outside your immediate colleagues and collaborators. To such an audience you need to clearly explain the novelty and importance of your proposal and why you are the best person to do the work. Your proposal will not make through to the second round if the panel cannot understand what you are going to do and why you should do it. However, almost every panelist would agree that there are more proposals worth funding than actually do get funded. This is why it is important to try again the following year if you know you were close to the cut-off. My first successful proposal made it through to the second round three times before it was funded. Finally, as for the wisdom of giving “large grants to few people”, it is important to take into account that New Zealand has a full-cost recovery funding system, whereas Canada’s NSERC and Australia’s ARC provide “marginal” funding. That is, in Australia and Canada, your grant covers the marginal costs of the research (consumables, travel, equipment, post-docs etc) while in New Zealand, your grant has to cover these *plus* your salary and associated overheads. Thus while Marsden grants may look large on paper, in practice they are not as large as they sound. There are few scientists in New Zealand who would not like to see more grants go to more people. Thanks for the reply. Feedback in terms of specific things that could be “improved” (a very subjective term) might be useful, but as you say it would consume time of the panel. I think the ranking info would be very useful. The other point: do you know why NZ has full cost recovery and other countries don’t? I don’t need a grant to cover my salary. I am already doing research as part of my job at a university. I need money almost exclusively for PhD students, postdocs, and travel costs. If I got such a large grant, I am not sure what would happen to the money – presumably much of it would be appropriated by the university. Wouldn’t it make sense (in some fields at least) to spread the money around, just for marginal costs? If most people agree that more people should be funded, why keep the present system? I am confused – perhaps you could explain its advantages if you have time. Why does NZ have full cost recovery? In CRIs and non-profit research institutions like Cawthron and Malaghan, researchers don’t have “other jobs”. Research is all they do and funding has to cover all their costs. In theory, the cost to the government (i.e. the cost to the taxpayer) is the same using the full cost model as it would be with the marginal costing that you suggest, because the university income that would pay for your lecturing largely comes from the government anyway, but via the Education Department instead of MoRST. Good question(s). Actually, the issue of full cost recovery vs marginal funding probably deserves several long posts but I will try to summarise briefly. Full cost recovery is predicated on the idea that governments are not very good at spending taxpayers money. In a marginal funding system, the government has to make two investment decisions: where to spend its money on bricks, mortar and salaries, and then where to spend its money on the direct costs of doing the research. You can imagine, especially if either decision is subject to open contestable bidding, that the two investments may not align well. With full cost recovery, however, the government can allocate its money through a single, hands off contestable process. It doesn’t have to decide behind closed doors how much to give each CRI each year, rather, this is determined by the competitive bidding process. In theory this should provide an efficient and merit-based allocation of funding within the science system. The advantage to the scientist operating in a full cost recovery system like ours ought to be substantial. Your funding is allocated with substantial oversight by your peers rather than by the Treasury, you should get genuine relief from teaching if you are at a university (ARC Discovery grants for instance explicitly exclude the possibility of paying investigator salaries) and you shouldn’t have to write multiple grants to fund one piece of work (e.g. I got the Marsden but not the grant to buy the microscope I needed). In practise, however, our small size and very low levels of funding per scientist mean that we don’t always enjoy these benefits, and our overly competitive system has led to many perverse outcomes (e.g. volatile fluctuations in funding, a preponderance of small poorly supported teams, and an inability to purchase large pieces of capital equipment that may benefit multiple institutions). This is one of the reasons we are moving away from this to a certain extent through CRI core funding.